Was your bike on for long when you ran out of gas? Why i ask this is because your carbs might have sucked up the excess at the bottom of your tank. It depends on two things, you might just need to bleed your carbs or you might have to remove them and then clean them. Firstly at the bottom of your carb you will see a small screw (its near the bowl) open the screw and gas will come out, leave it open for 10 seconds and then tighten back up. Do this with all your carbs. Wait for the bowls to fill back up then start your bike. Secondly and this is only if the first one did'nt work. You will have to remove the carbs and remove the bowls and wash them in gas. Your carbs might have the excess from your tank and thats why you are getting a poor responce. Your carbs are been blocked from the excess. Its not that hard to do it just takes patience. A good carb cleaner is power pills. Simply drop two pills in your tank every time you get gas, power pills break down the excess in your tank so you have clean gas all the time. Your carb problem is one of these you just need to find out which one. Well I tried to remove my plugs but the middle 2 are kinda rusted and hard to access, Where would I get power pills from and are the screws you talk about accessable without taking the carbs off?? The screws you are looking for are on the bottom of the carb. 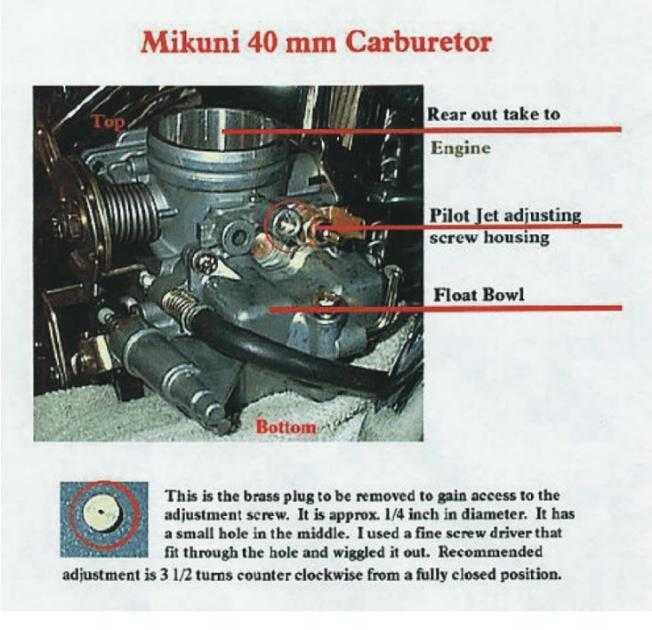 Look at the bottom of the carb where you see a bowl shape the screws are there. Just open the screw to let the gas in the bottom of your carb escape. I got the power pills when i was travelling but ill find out for you. The two inner carbs will be hard to get at but with a long screw driver it wont be a problem. Your carb bowl has excess from your tank and it might only be small bits that can be flushed out when you bleed the carbs. Any bigger bit will result in removing the carbs and cleaning the bowls. Here is a pic of your carb. You can see the pilot jet adjuster marked. Thats where the screw is. Quick Reply: HELP!!! My Bike Is a DOG! !